Can you imagine exchanging your vows surrounded by nature at a beautiful Yucatecan hacienda, on the edge of a sacred cenote, or with a beach in the background? 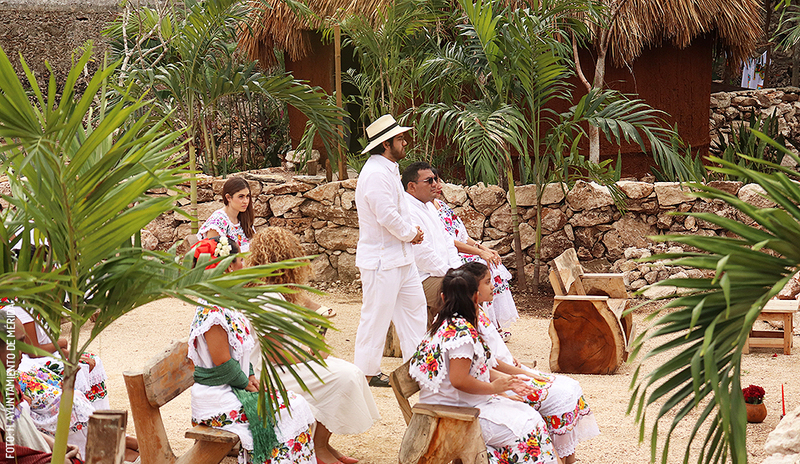 Any version of a contemporary Maya wedding can become reality in Yucatán. You will feel the mysticism of this millenial culture as well as a unique atmosphere with conch and tunkul music, copal incense, the aroma of flowers and cinnamon, taste of balché, corn and cacao…and of course, much love. This symbolic and spiritual ritual, without legal status, can be celebrated by any couple throughout the year, either as first or second nuptials or as renewal of vows. 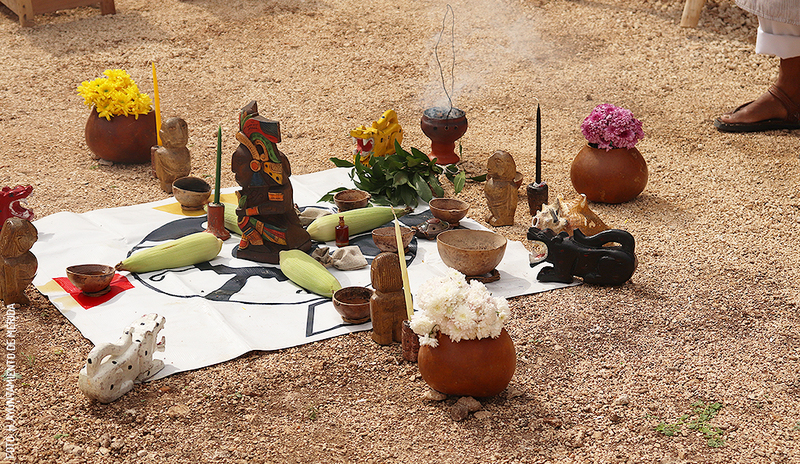 The ceremony is performed by a shaman (woman or man) drawing a circle on the ground with sugar and placing bowls and colors to identify the four cardinal points: red to the east, white to the north, black to the west, and yellow to the south. In the middle, the bride and groom dressed in white will be positioned, surrounded by the relatives and friends who can also be dressed in light colors. It begins by invoking in Maya the four elements (water, fire, air, and earth) and asking permission of the earthly and celestial plane to perform the ceremony. While the smell of copal and the sound of the conch shell floods the environment, the bride and groom give each other symbols: corn as food for body and spirit, cacao for prosperity, and honey for sweetness. If you prefer, also rings, thoughts, or vows and wreaths can be exchanged. The couple is offered the sacred balché drink which is shared with all the people present. The ceremony lasts approximately 45 minutes and culminates with a meal of regional dishes to celebrate with family and guests. Depending on the environment, whether it is an open or cave-like cenote, a beach, or a garden, an additional offering is made to the sea or to the land. If you are looking for a cenote as a stage, those of Homun including Chulul, Yaxbacaltún, or Hool Kosom are good options; Sac Aua in Temozón; Carlota and Blue Maya at Hacienda Mucuyché; or Xbatún in San Antonio Mulix: all are a magical experience. The cenote at the hacienda Sotuta de Peon, Hacienda Chichén Resort, Hacienda Santa Cruz and the beaches of Celestún offer unforgettable views. The Maya wedding can be complemented with a civil ceremony that gives validity to the union. Currently there are shamans and wedding planners who can handle the paperwork and license, especially if they take place in cenotes or private places. Prices vary depending on the options and additional services, which can be a temazcal bath, romantic dinner, massage, accommodation, walks, photo and video coverage, decoration, and more. 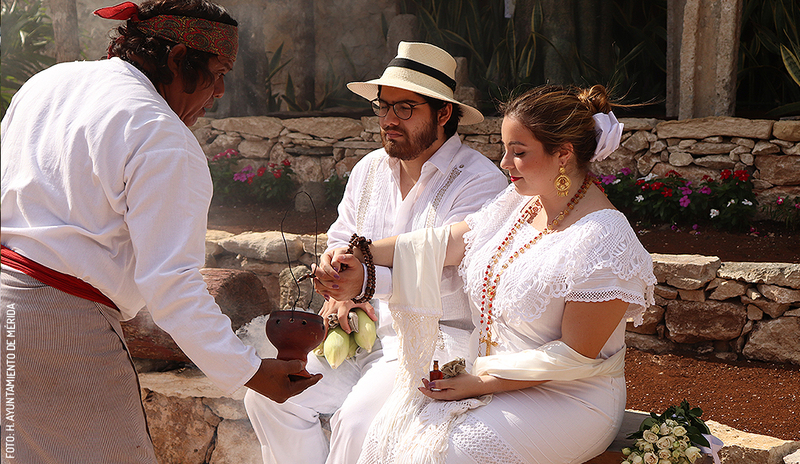 A Maya wedding in a natural and sacred setting in Yucatán is one of the experiences that can give a deep meaning to your union, an “I do” that counts on the blessings and mystical strength of this millenial culture. Celebrate your Wedding in Yucatán! Celebrate your Maya Wedding in Yucatán!